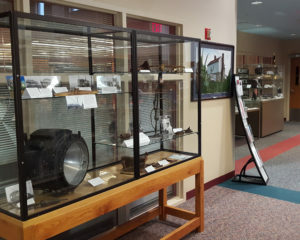 The H&FRHS has installed an exhibit at Frederick’s C. Burr Artz Central Public Library located at 110 East Patrick Street in Downtown Frederick. It will be in place from February 11 until April 29, 2019. One of four display cases outside the Maryland Room on the second floor of the C. Burr Artz Library. 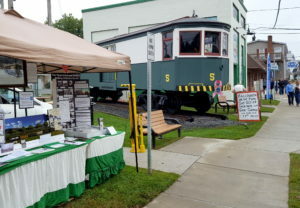 The Society often provides a small mobile exhibit of select items from the archives to festivals and events, and keeps a small display at the entrance of Hobbytown USA on Prospect St. in Frederick. In the future the Society hopes to find a larger home for our archives which would allow us to develop a research center as well as hold periodic open house events centered around artifact exhibits such as the one currently on display. Freight Motor 5 receives new doors. The Town of Thurmont has replaced the doors on Freight Motor 5 due to unexpected wear to those previously added to the car. The new ‘barn’ style doors have been painted and will continue to protect the interior of the car. The original doors seen on Motor 5 in historic photographs were removed and lost long before the car came to Thurmont. Further work is planned for the car in coming years including eventual public access and interior renovation as well as the replacement of several missing exterior components. In 2017 the H&FRHS assisted the Town in selecting colors resembling those the car was documented wearing in service. 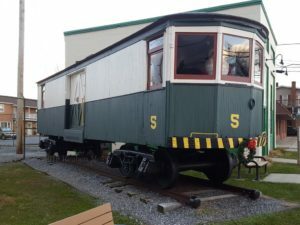 The car was donated to the Town of Thurmont by the Society after acquiring it from Railways to Yesterday, Inc. over a decade ago. It was constructed in Frederick in 1920 and served the entire H&F system, being retired from Frederick-Thurmont service in 1955. Motor 5 can be found beside the Thurmont Fire Company Carnival Grounds on the former site of the Hagerstown & Frederick Railway Passenger Station. The Thurmont Trolley Trail and Memorial Park are located immediately across Main Street. 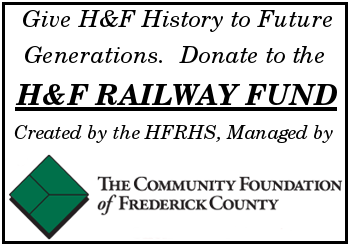 The fund was created by Alex Postpischil, one of the founders of The Hagerstown & Frederick Railway Historical Society (H&FRHS), located in Frederick, Maryland. Grants from the fund will assist H&FRHS with preserving the heritage and history of the electric railway system that served these communities in the first half of the 20th century. 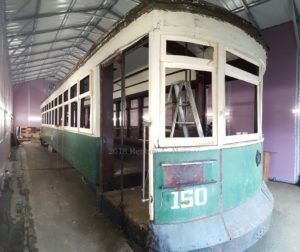 Potential grant uses will include preservation efforts of artifacts and surviving trolleys as well as information signage and educational programs. The 87½ mile network of passenger and freight trolley service was a vital link for farmers, merchants, and students. Learn more at www.hfrhs.org. To make a secure, online donation to The H&F Railway Fund, visit www.FrederickCountyGives.org/HFRailway. Checks made payable to The Community Foundation of Frederick County may be mailed to 312 East Church Street, Frederick, Maryland, 21701, with the name of the specific fund on the memo line. All donations are tax deductible to the fullest extent of the law. To learn more about how the Community Foundation impacts Frederick County, visit www.FrederickCountyGives.org. 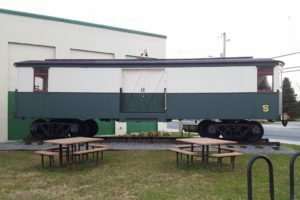 The Town of Myersville, Maryland has purchased H&F #150 and is in the process of renovating the car for use as a reading area in the new Myersville Library slated to open in August of 2019. Members of the H&FRHS are in contact with the town and have been providing technical information on componants that the 44′ 1918 coach is missing. Portions of Coach 150 are exposed after wind tore the tarp. After two years of inclement weather and direct sunlight, tears have developed in the tarp protecting #150. In response to the tarp damage, society member Reuben Moss has prepared a study of the car’s condition. The tear will be covered by a temporary tarp in January as the society develops a long-term plan for preservation and maintenance. #150 is a suburban coach which served on the H&F Railway in the Hagerstown area from 1923 to 1938. It is now privately owned , with maintenance assistance provided by members of the HFRHS. 200 East Patrick Street, former H&F Station. The City of Frederick has narrowed the placement of the downtown hotel and convention center to be situated in part on the property at 200 E. Patrick Street. Follow the development at the City website, www.cityoffrederick.com. This property once served as the Frederick station of the Hagerstown & Frederick. Society members Reuben Moss and Harry Meem with the newly covered #150. Suburban Coach #150 in Myersville has been covered in tarps to protect it from the weather. Due to family circumstances, the car needs repairs but cannot be done at this time. The society purchased the tarps and H&F Society members Harry Meem, Reuben Moss and Richard Benjamin covered the car.